Butter, although made from milk, does not belong to the dairy group. Tthe U.S. Department of Agriculture excludes butter from the dairy group because it contains only trace amounts of calcium. Butter is considered a solid fat and belongs to the SoFAS group, a category made up of solid fats and added sugars. Unsalted Butter has 714 Calories and 78.57 g of Total lipid (fat) per 100 gram serving according to the nutrition facts provided by the USDA Food Composition Database. There are three main types of nutrients: carbohydrate, protein and fat. Butter is almost exclusively fat -- the protein and carbohydrate content in a stick of unsalted butter totals less than 1 gram. Butter is high in saturated fat, a type of unhealthy solid fat that tends to raise your cholesterol levels. One stick of unsalted butter -- a common measure in baking -- contains about 810 calories and 58 grams of saturated fat. Each 1 tablespoon of butter contains 113 calories and 11.5 grams of fat. 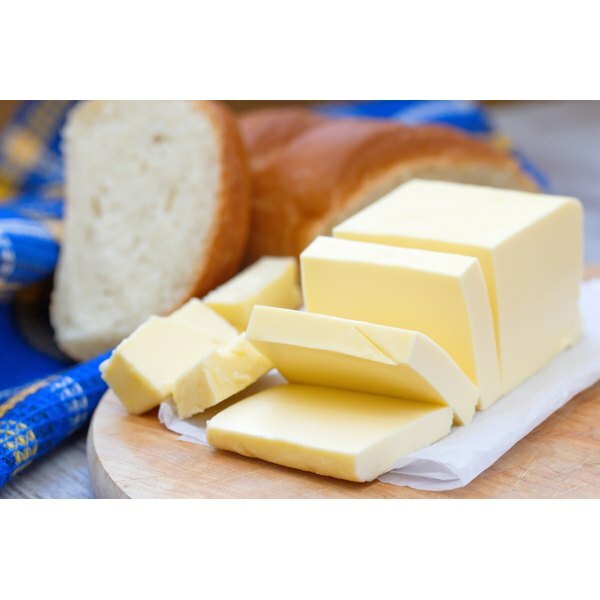 Butter also contains cholesterol, another type of unhealthy solid fat that may increase your blood cholesterol One stick of unsalted butter contains about 243 milligrams of cholesterol. Butter is a source of empty calories, meaning it has little nutritional benefit. Butter does not contain any dietary fiber and is exceptionally low in vitamins, minerals, and protein. For example, a stick of unsalted butter contains only 27 milligrams of calcium, 2 milligrams of magnesium and 27 milligrams of potassium. In general, you should not consume more than 260 calories worth of SoFAS per day. Consider that 2 1/2 tablespoons of unsalted butter will just about fulfill your allotment of SoFAS for the day. Keep in mind that SoFAS are in a variety of foods besides butter, including prepared meats, chocolate, ice cream, cheese, pastries, soda and desserts. Don't substitute margarine for butter at home, and avoid commercial products that contain margarine. Margarine, like butter, is a solid fat. Stick margarine contains less saturated fat than butter, but it contains trans fat. Trans fat, a processed fat that turns liquid vegetable oil into a solid fat, is more harmful to your heart health than saturated fat. Read product labels. A nutrition label will tell you how much saturated fat and trans fat a food item contains. A list of ingredients might call margarine hydrogenated or partially hydrogenated vegetable oil. One of the simplest ways to help cut down on your intake of solid fats is to stop using butter as a condiment. Get out of the habit of automatically topping all of your food with a dollop of butter. If you feel your food needs more flavor, try experimenting with a variety of herbs and spices. For example, instead of spreading your morning whole-grain toast with butter, try sprinkling it with cinnamon. And the next time you have a baked potato, skip the butter and try ground black pepper and fresh basil instead. When you're cooking, try replacing butter with a heart-healthy unsaturated fat, such as olive oil, canola oil, corn oil, soybean oil or sunflower oil. ChooseMyPlate.gov: What Are "Solid Fats"?